We had another early morning call today - I don't remember how early, I don't want to remember how early, but it was EARLY and still dark outside when we loaded onto the bus to the airport for our flight to Xi'an. I guess I was awake enough at that hour to find the need to entertain myself. 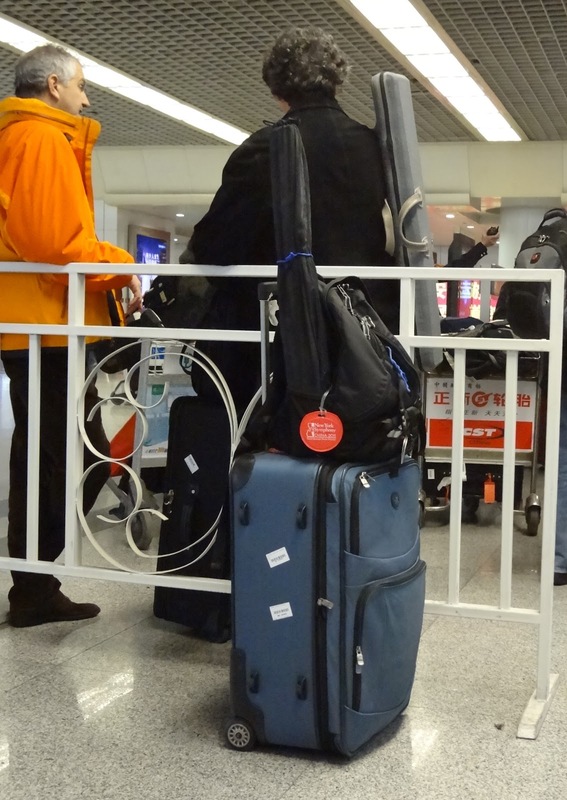 So here's an exciting photo of my trusty suitcase, backpack, bow case, and a couple of trombone players. Whoop-Dee-Doo. 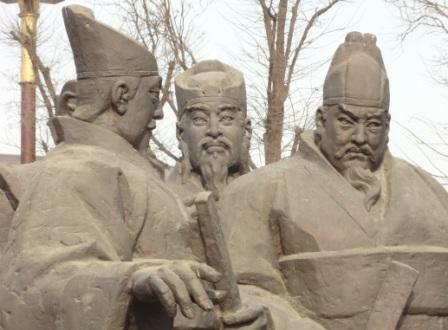 We arrived in Xi'an relatively early in the day. 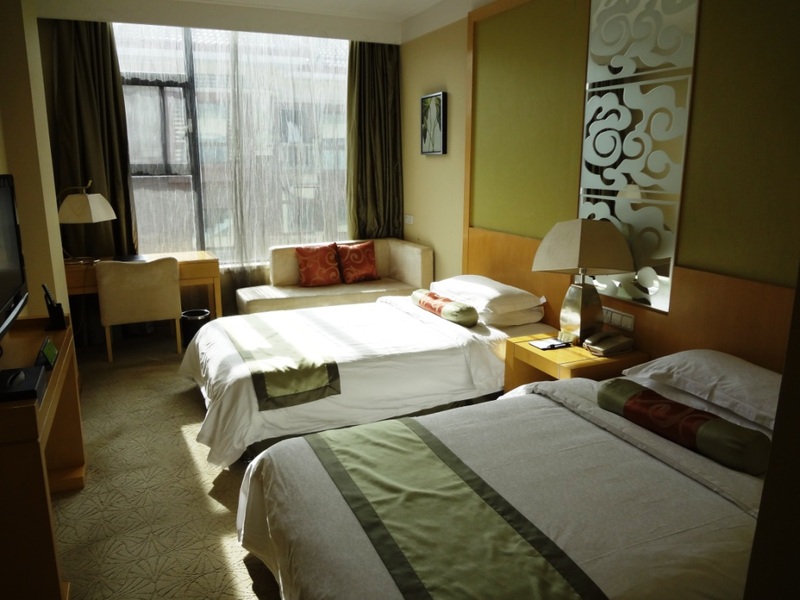 The air in Xi'an was fresh and clean, allowing for some delightfully intense sunshine to flood our hotel room. This was one of my favorite rooms of the trip in spite of the fact that there was less storage space than usual. It seems like almost every room on our tour had some weird little issue, although I wouldn't exactly describe this as little. But over all the room seemed very clean and it did not smell at all, which made it much easier to not think about what might be growing there on the door frame. 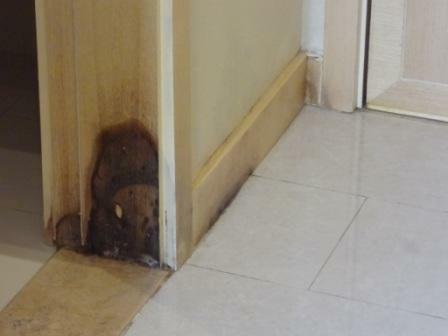 I was very pleased in general with the lack of smell in most of the hotel rooms I had in China, especially considering the prevalence of smoking and the occasional lack of cleanliness in certain areas we visited. Either they don't use those nasty scented carpet cleaners the way hotels do in the US, or they have a secret smell-obliterating formula. And no matter what else might have been amiss in the cleanliness department the bedding and towels were ALWAYS immaculately clean and fresh. So that was really nice. Anyway, we had plenty of time to walk around the newer section of Xi'an where we were staying and performing that night. 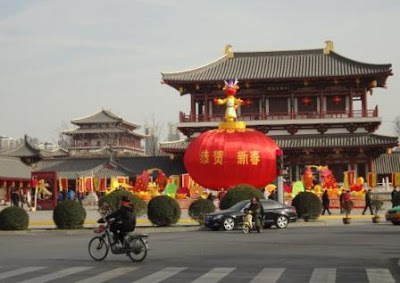 This part of town is all dolled up and kept extra clean, presumably because it is the gateway area for all of the tourists who come to see the Terracotta Warriors. It was nice to be in a clean city for a change, even though it felt kind of artificial. They had a big western-style shopping center, with prices to match, and all kinds of interesting sculptures decorating the streets and walkways. There were lots of brand new traditional style buildings. 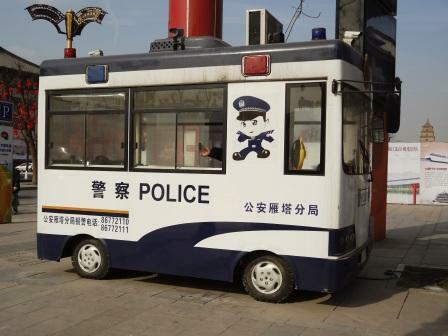 The police presence seemed much gentler and more friendly than usual. They even have a complaint box. 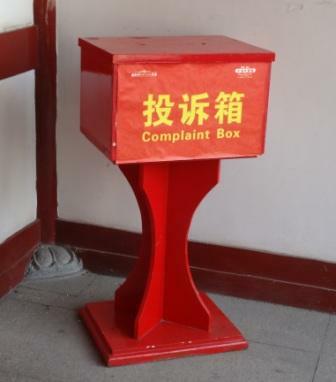 I didn't know that lodging a complaint was an acceptable thing to do in China. All over town there were what I'd call "preview statues" to get everyone in the mood to go see the real terracotta warriers. 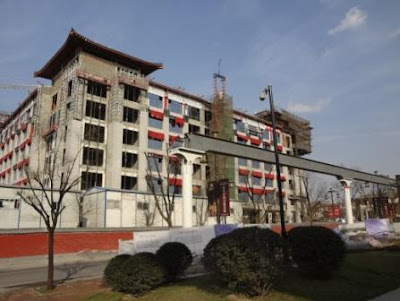 This part of Xi'an is even going to have a monorail eventually. Just like Disneyland! 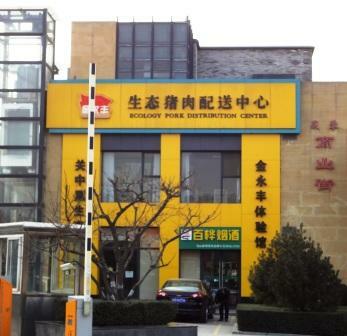 Here's the Ecology Pork Distribution Center. Who knew that pigs could be contributers to ecology? 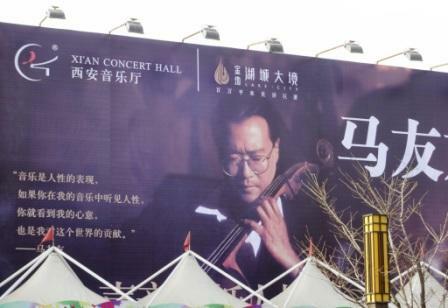 It was nice to see that we were in such good company at the Xi'an Concert Hall. If it's good enough for Yo Yo Ma, it's good enough for the Park Avenue Chamber Symphony! 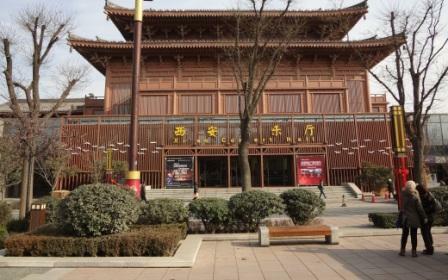 The Xi'an Concert Hall was a wonderful venue in which to perform our final concert of the tour. After the concert they took us to what I think was the Muslim quarter and we had a dinner that was unlike any we'd had during the rest of the trip. The restaurant was filthy and I was still queasy from my digestive issues the day before, and had no appetite at all. I had no desire to eat more germs. But I did try a few sips of one of the soups and it was absolutely delicious - very different from any of the other soups I'd had. The dumplings were amazing but I was only able to eat two of them. The lamb was kind of grossing me out - they had a couple of sheep torsos out on the barbeque in front of the restaurant that we passed on the way in. Anyway, it was a very interesting place and I'm glad I got to see it. I probably would have enjoyed it more if I hadn't been still recovering from the previous day's stomach issues. The big red thing looks like a drum, although that could just be my percussionist brain wanting it to be, lol! 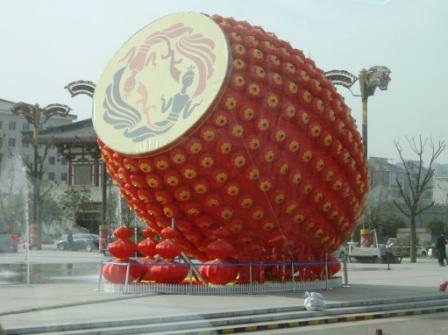 I'm sure it's a drum - but I was still trying to work out a way that it could be dragon fruit. Ha Ha, I guess not!